Posted in KDE.Tagged kde, kpmcore, lvm, partitionmanager. 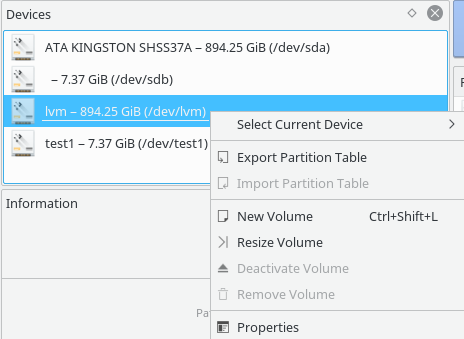 It’s great to see what you made out of partitionmanager and the library coming along helping Calamares to do it’s partitioning. I’ve been one of those dabbling in the code, never had the nuts to really drive it forward or take over. Kudos, well done, a lot of people benefit highly of the progress and implementations you did. Thanks for all the work and dedication. So any ideas which option (1 or 2) makes more sense?